One man indie game developer Niels Bauer Games, based in Freiburg, Germany has announced some news about their Sci-Fi Space Trading/Combat game Smugglers 5. The fifth installment of the Smugglers series will be receiving a standalone expansion on October 9th called “Invasion.” You can get your hands on the game for $9.99 on PC via official site, and GOG. Interested in the game coming to Steam? Help by voting for Smugglers 5: Invasion on Steam Greenlight. 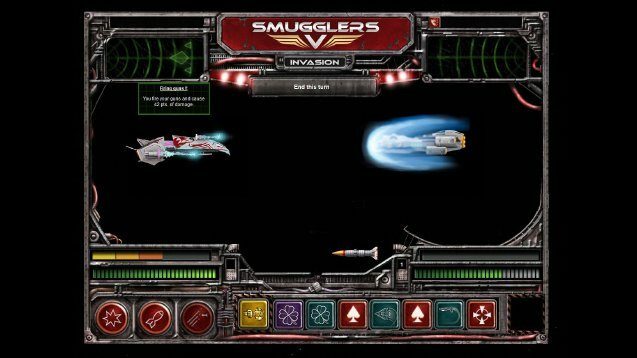 In Smugglers 5: Invasion, players will experience a turn-based single-player game that takes place in space, where you decide who you will be in this trading/combat game series, whether it be a greedy trader, a mercenary, or a ruthless pirate. Continue the game where the original has left off, where the Federation has won the civil war and has crushed all rebellions. Take on enemy ships and board them, manage factories, conquer star systems, and take on space with your own empire to take on the galactic world, where you decide its fate. The dream was to go for peace, and to repair from the damages from the long and bitter civil war in the galaxy, but all that ends with the new alien race, Jalkath, came into the galaxy. When you look at the Jalkath, you will notice that they are more like the tigers, instead of an alien race. The Jalkath have the same traits as tigers as well, because they soon showed the humans that they are cunning and dangerous, and they should watch out. “The newcomers were swift and brutal in their assault, deploying terrifying weapons and subjugating entire systems before their victims even knew what was happening.” The Federation is preparing their defenses in order to fight against the invaders, and both sides are ready to fight no matter what, in order to dominate the galaxy.